Which is why polo has two mounted umpires and a referee watching from the stand. Which is why no one agrees to which rule has been flaunted and what penalty should be exacted!! So the whistle blows, and after a quick conference between the umpires and often some of the players (which is not allowed) an arm will be lifted to the referee which means “Do you know what happened?”. The referee answers with the same red indian greeting. In polo parlance “yes!” and he points to the side to which has fouled and the direction in which the ball must be hit. Often he is as confused as the two umpires and will walk down to the touch line for a chin wag and then make a decision. Complicated? All part of the fun! Each game is divided into periods called ‘chukkas’, seven minutes in length and a bell will ring to let the umpires and players know time is up. However, time is not up. It goes on, for another bell signifies the end of the chukka. The players will then troop off to change ponies, they have three minutes to do this (or do whatever players have to do). At half time they get five minutes to do whatever. Each player has a handicap. Like golf it enables the brilliant to play with the hopeless. The handicap works the reverse of golf. The very best are rated at ten (goals as opposed to strokes) and the beginners start at minus two. Now this is great at cocktail parties. “What’s your handicap?” asks the young and impressionable. “Zero”. “Wow!” says the now even more impressed. The team count up all the handicaps and match it against the other team. The side with the deficit is given the difference and this is shown on the scoreboard at the beginning of the game. The deficit is often shown as half a goal – all worked out by a formula which most of the players are quite happy to leave to the umpires. DO NOT CROSS another player. (This doesn’t mean shouting at him and telling him that his parentage is in question). A ‘cross’ is when a player following the ball must be allowed a clear road ahead. No rushing in from his right or left trying to steal the ball. The ponies may get hurt and most rules are to protect them not the madmen on top. There are variations. A player can cross if the ball player is half a mile away, or is wiping his nose instead of getting on with the game. It’s all a matter of degree. Hence most of these umpire ‘pow wows’. DO NOT FOUL HOOK. Let us first explain a ‘hook’. A hook is when a player is about to hit the ball and an opponent hooks or strikes the polo stick to deflect the aim or stop the stroke altogether. This aspect of the play does explain why some perfectly good player lining up for a perfectly easy shot seems to miss it. He’s been hooked. A ‘foul hook’ is when a player is not on the same side of the player being hooked as is the ball. In other words a foul hook is an attempted hook across a ponies legs, under the belly, over the back or around the tail. DO NOT ENGAGE in dangerous riding or rough handling. Never hit a pony with a polo stick, or ride into another players pony at an angle. 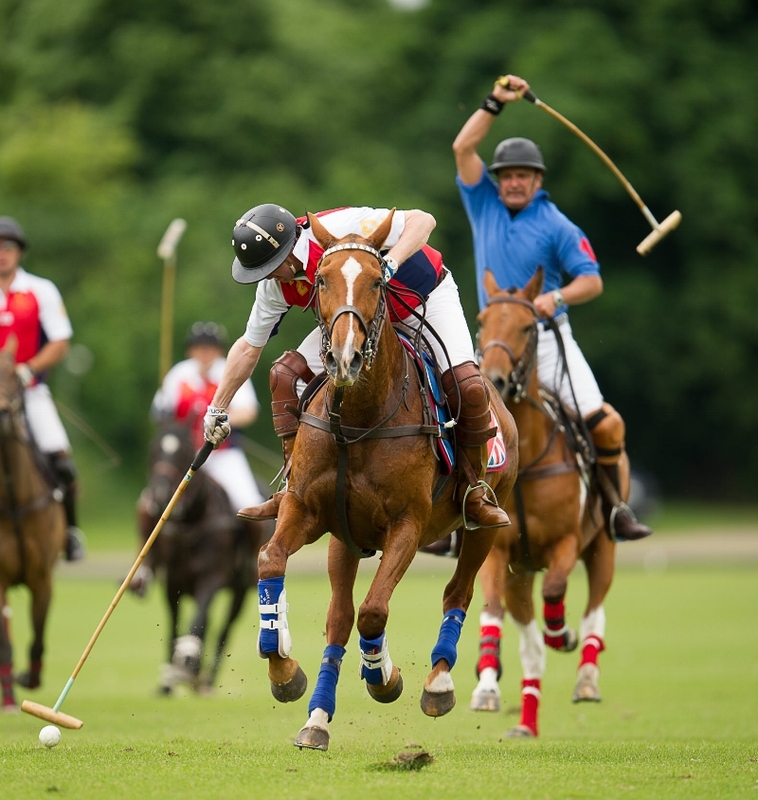 Polo players can ride alongside another player thus preventing that player access to the ball. Its called a ‘ride off’. Its fun and the ponies love it. So if two players are seen galloping together at the other side of the field to where the ball is being played it could be that they are getting to know each other or more possibly that one player is ‘riding off’ another away from the play. Indications of this are when the scream of “Take the man!” is heard. This could mean take the woman but in the heat of the moment who cares? “Take the man!” usually means that the player behind has a better shot and is possibly alone. Then according to the book one should see the player disengage from the ball and ‘ride off’ an opponent. Penalties are taken by having a free hit at the ball with opponents no closer than thirty yards away. When play is close to the goal you’ll find defenders must be behind the back line and cannot come through the goal mouth to protect the goal. These penalties are called by the number of yards they are from the goal (which is eight yards wide). So there is a 30 yarder, a 40 yarder and a 60 yarder marked by spots and white lines. No corners. The ball is played on the 60 yarder opposite where it went over the base line. To commence play from a neutral position the ball is thrown in between the two sides by the umpire. Two players coming towards each other must pass right hand to right hand. That’s it really. Oh, about the ponies that are not ponies but horses. There used to be a height restriction way back in the 1880’s. 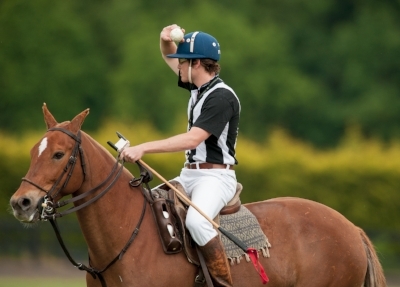 No polo could be played on a pony over thirteen three hands (55 inches). It all looked very silly with the riders legs dragging along the ground so the Americans, quite rightly, decided to ignore this particular rule and rode horses that were much faster than ponies. The riders didn’t look so ridiculous either and after beating the Brits quite soundly the English governing body the Hurlingham Polo Association. followed suit but still called the horses ‘ponies’ thereby having the last say after all !